This recipe came to me in a flash of inspiration one Saturday morning, and although I have since discovered that the octopus-legume combination is appreciated elsewhere in Italy, I still feel some smug satisfaction for having “invented” the recipe before finding out that actually I hadn’t. I say “recipe” because that’s what it is, but only in the same way that “ham sandwich” is a recipe. Unlike a ham sandwich, it does involve cooking, albeit of the “beans on toast” variety. In other words, it requires opening a tin of legumes and heating the contents in a saucepan. But not much else. In fact, it feels more like cheating than anything else, and like all good cheating, gives maximum result from minimum effort. … brings us rather niftily on to the way I cook octopus… Forget very quick (or very long) cooking. Forget freezing it first. Forget whacking it against a rock on the seashore (apart from anything else, you may not have a rocky seashore within easy reach or may prefer not to be mistaken for a lunatic). Forget putting a cork in the water or any similar mumbo-jumbo. Cooking octopus to perfect tenderness does not require going to such lengths. Forget everything anyone has ever told you on how to avoid tough rubbery tentacles, and arm yourself with a non-stick saucepan. Nothing else. Well, apart from the saucepan’s lid. Wash the octopus and place it in your saucepan. Put the lid on and cook over a low-medium heat. An average size specimen should take about 40 minutes, but prod it occasionally with a fork to check from 30 minutes onwards. There is no need to add water or salt, since the octopus will release both when heated, and literally stew in its own juice. Most people are wary the first time, and, convinced the octopus will burn, add extra water. Resist the temptation. You may need to add a little towards the end, but if you’ve gauged the heat right, the pan drying out should coincide with the octopus being cooked and perfectly tender. Take off the heat and leave to cool, preferably in the pan with the lid on. The flavour of octopus cooked like this is umami-rich and intense. It quite simply tastes of the sea, in the best possible way. The octopus can then be served at room temperature, in a salad with parsley, lemon juice, pepper and olive oil, or cooked further, as in today’s recipe. Sautéing or grilling the octopus gives it a slightly caramelised skin and crunchy tentacle tips that take this mollusc to an even higher level. The chickpeas provide the perfect backdrop and contrast – soft and creamy playing off against meaty and salty. Cook the octopus as explained above. Leave to cool slightly. In the meantime, open a tin of chickpeas and pour contents into a saucepan, including the brine. If this is particularly salty, just use less, and top up with fresh water. Heat the chickpeas through for about twenty minutes (with the rosemary if using) to soften them up, and then use a hand blender to reduce them to a cream, adding extra water if necessary. Simple as that. Embarrassing, I know. When the octopus is cool enough to handle, divide its tentacles from the head and the tentacles from each other. Cut the head into smaller pieces. Sauté the octopus in a little olive oil over a high heat until the edges of the tentacles start to brown and crisp up (about five minutes). Reheat the chickpea cream if necessary and pour into bowls. 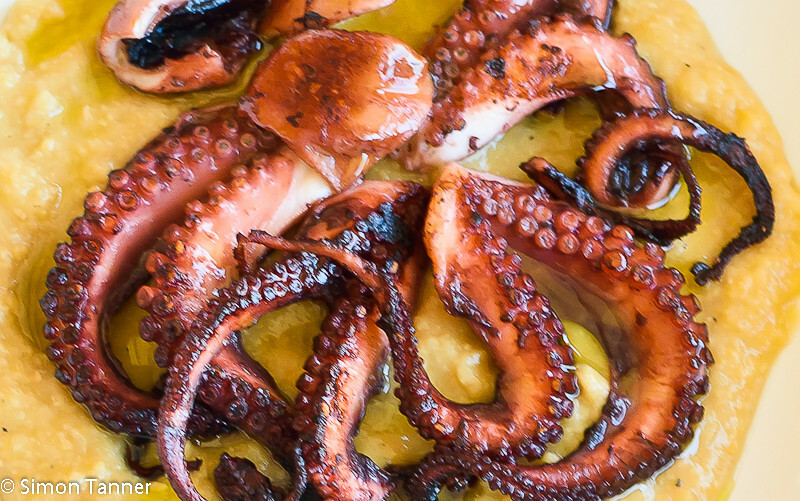 Arrange the octopus pieces on top, drizzle over a little olive oil and serve. A light red goes just as well with this as a white, since octopus has a certain meatiness. That said, it’s still seafood, and a white with some body works well too. However the mood takes you. Unlike for beans on toast, I would not recommend a cup of English Breakfast. This entry was posted in Fish, Recipes and tagged ceci, chickpeas, octopus, polipo by hungryenglishman. Bookmark the permalink. Thanks Therese, really appreciate the feedback! Hope you enjoy eating it as much as I did! It is a mollusc, though, at least according to Wikipedia: “The octopus is a soft-bodied, eight-armed mollusc of the order Octopoda”. I’ll be honest, I didn’t think it was either, but apparently they don’t all have shells.